I just spent quite some time debugging a macro for a forum member in a private thread, until I discovered by chance that he used the %Return% token to build a multi-line variable. Of, course, when passing that variable for example to a sort Shell Script action it fails completely, since every Unix tool is expecting linefeeds, not carriage returns. As far as I know, carriage returns were used only up to Mac OS 9. BTW, in the same article %LineFeed% is misspelled as %Linefeed%. The %LineFeed% token returns the linefeed (0x0A) character. Does anyone find this useful? So, I guess it’s OK to show the hex value, but it should be last, and identified as such. The %LineFeed% token returns the linefeed character. It is often referred to as LF, \n or just linefeed. You guys please correct me if there are any errors in the above, or you have suggestions for clarity and/or completeness. 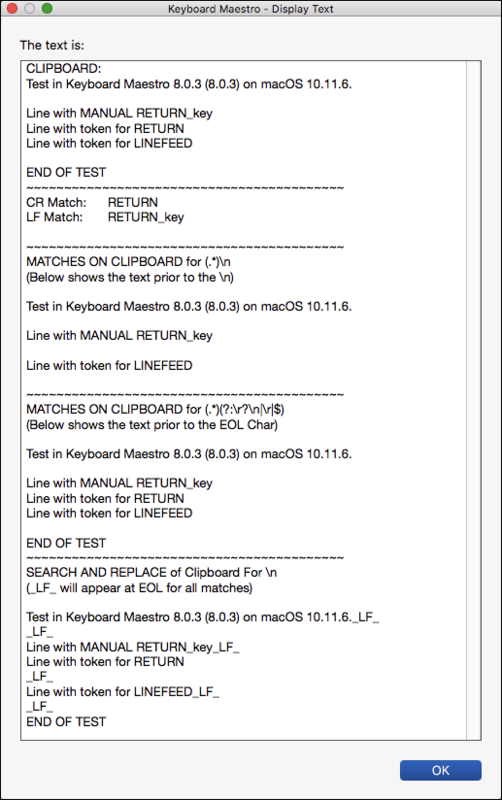 It is correct that the native Mac OS line endings were CR, and native Mac OS X unix susbsystems are LF line endings. However, traditionally on the Mac, the clipboard uses Return (CR) characters even in OS X. That remained for many years after the transition to OS X (when native Classic Mac OS applications ran along side native Mac OS X applications). In fact there were many years when a LF on the clipboard was highly likely to cause problems. At this point, when dealing with the clipboard, a CR is perfectly reasonably and likely more often handled correctly. Any modern Mac application should handle either CR or LF (or, frankly, CRLF), but that is not always the case. When dealing with the shell or unix subsystems, LFs are definitely essential, so it is worth a mention on the Return and LineFeed token pages. @JMichaelTX, your text looks fine, although what you get from a manual press of the Return key, I couldn’t actually tell you - if it matters, you should ensure you get what you want. When sending text to the shell, Keyboard Maestro takes pains to translate the line endings appropriately regardless of the line endings in the text field. So, if I understand correctly, you are saying for clipboard content that will be passed to Mac apps (not Unix programs) it is safer to use CRs than LFs? …recommended for clipboards that will be passed to Mac apps. That is fairly correct, although at the end of the day you’ll need to ensure you use the appropriate one in the appropriate place and there is no single correct answer. As stated, yes, that would be my recommendation. However there are almost certainly a few Mac applications that don’t work with CR line endings on the clipboard. For shell scripts, LF will pretty much always be the correct. You can use the Keyboard Maestro Filter action to ensure the line endings are as desired. However, traditionally on the Mac, the clipboard uses Return (CR) characters even in OS X.
Peter, I’m not sure what you mean by this. Are you saying that, somehow, the System Clipboard is changing LF characters into CR characters when they are copied to, or pasted from, the Clipboard? That assertion is not supported by a number of tests that I have just done, using AppleScript, KM, BBEdit, Clipboard Viewer, and the RegEx101.com web site. (details later). At this point, when dealing with the clipboard, a CR is perfectly reasonably and likely more often handled correctly. Actually, from what I am seeing, it looks like to me (subject to further testing and confirmation by others) that it is best to always use LF as the EOL (End of Line) character, rather than CR. I don’t see any advantages of using CR (for Mac apps/data) over LF. Of course, if you are producing text targeted for Windows, then it is best to use both: CRLF. 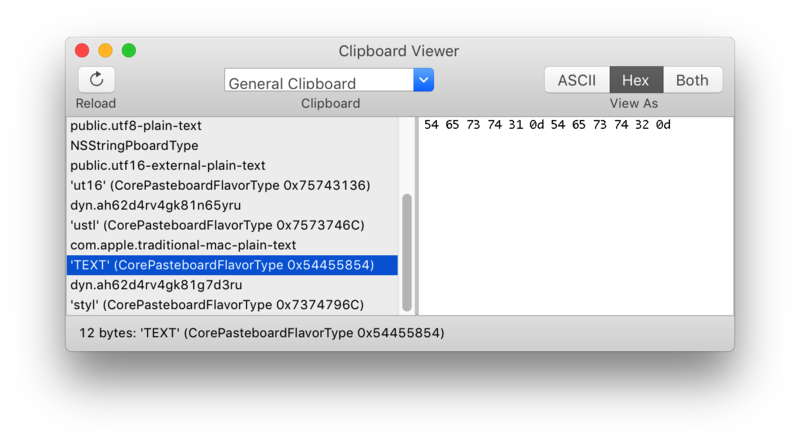 LF characters put on clipboard by AppleScript, and KM macro, remain as LF, as evidenced by reading the Clipboard by AppleScript, by pasting into BBEdit, and by viewing by the ClipBoard Viewer.app (not KM). When I press the RETURN key, it generates a LF character in all of my apps (KM, AppleScript, BBEdit). 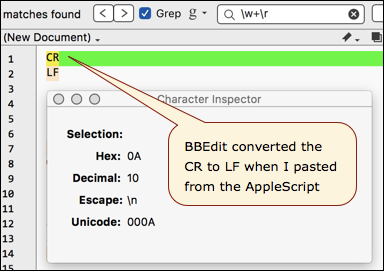 While the CR character is shown properly by the Clipboard Viewer.app, NONE of the CR characters are found by a \r search in BBEdit. This could be due to BBEdit settings I have. 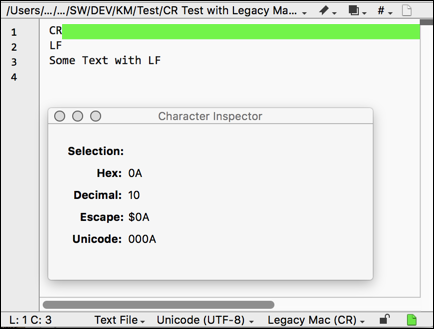 Both LF and CR characters put on the Clipboard by AppleScript ARE found (matched) properly by a KM RegEx Search of Clipboard. Major Issue: When text is pasted into RegEx101.com, ALL CRs are converted to LFs. I will report this to the developer. Issue: When the KM token %Return% is at the end of a line with a manual RETURN key press, only ONE return is generated (should be two). All of this needs to be confirmed by others. The `\r` does NOT match any character of text pasted from AppleScript or KM Clipboards. When text is pasted into this web page, this panel, it evidently converts all CR (ASCII 13) to LF (ASCII 10). Confirmed -- same results here. Very strange. In BBEdit \r always finds both (LFs and CRs). In the first example (with the unrecognized char) the CR does not work as line break, since the editor can’t handle two different kind of line breaks in one document. The CR ist recognized as CR but does not “function” as a CR. The same in BBEdit: when you open the Character palette it is clearly identified as CR (Ascii 13), but BBEdit simply does not have a way to display it like TextMate. But still interesting that the order decides if the CR gets converted into a LF or not. As you see in the screenshot, TextMate does not care about the order, it always preserves it as (non working) CR. Is it that, or has BBEdit converted all of the CRs to LFs? Unexpected, and unwanted, unless I set an option somewhere in BBEdit to do so. has BBEdit converted all of the CRs to LFs? Yes, that’s what I tried to say in the last paragraph. (In contrary to TextMate, which preserves them.) Unless the CR comes first, then it does not convert it, for unknown reasons. I think \n and \r are (almost) synonymous in BBEdit. Try to replace all \n by \r. You will still have linefeeds. It’s the document setting (at the bottom of the window) that decides over the type of linebreaks. See also page 148 and 173 of the BBEdit manual. It’s the document setting (at the bottom of the window) that decides over the type of linebreaks. The line break setting (at the bottom of the window) decides which kind of line break is written to file. In the editor (the open document) there are always LFs, even if the line breaks are set to “Legacy Mac (CR)”. However in the document on disk you’ll find CRs then. Create a document consisting only of a line break. Set the document to “Legacy Mac (CR)”. In the editor (the open document) there are always LFs, even if the line breaks are set to “Legacy Mac (CR)”. So, what that means, is that there is no apparent way, using BBEdit, to find/replace all \r with whatever, correct? Bummer. I'm really surprised that BBEdit would behave this way. I'm hoping that Chris (@ccstone) will jump in here soon to shed some light on this. that there is no apparent way, using BBEdit, to find/replace all \r with whatever, correct? I think you’re missing my point. I don’t want to change all of the line breaks. I may just want to change wherever I have a string like “some text\r” to something else. KM can do this, so I guess I’ll just have to do it there. I think a text document with mixed line breaks is not a very sane document. So, honestly I’m very happy with the way BBEdit works in that respect. Some years ago I had to work with Windows people and those produced very weird stuff sometimes. I highly appreciated that BBEdit made it so easy to “normalize” that. But I understand that there might be needs to selectively treat CRs. Though I cannot think of a concrete example at the moment. Peter, I'm not sure what you mean by this. Are you saying that, somehow, the System Clipboard is changing LF characters into CR characters when they are copied to, or pasted from, the Clipboard? I said that Mac applications use Return (CR 0x0D) characters in clipboards. If you copy text in Mail or Pages, the text has Carriage Returns in them (except in the UTF8 flavor apparently). But yes, the system does mess around with them when it generates different flavors. Do not use BBEdit as an example, it does many different things and has deep handling for line endings far exceeding (and different) to most applications. 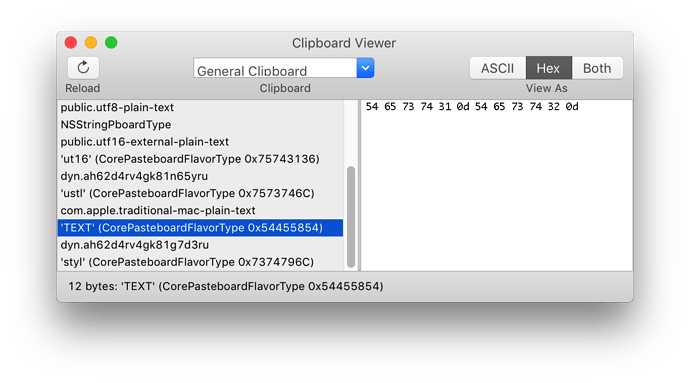 Basically, you cannot rely on the line endings in the clipboard being anything in particular, and for most text flavors it is more likely to be CR than LF, even today. But what you said in correction makes more sense, and is what I was expecting. IAC, I take your main point: Any searches need to check for either CR or LF (or even both). That’s where the RegEx \R is so powerful. Unfortunately it isn’t supported on all RegEx engines and/or all macOS. I’m sure you can improve on that. But I still have one question: While using KM, what would be the advantage of using %Return%? Seems like LF (%LineFeed%) (shouldn’t that be either “Linefeed” or “linefeed”?) is overall a better choice. OK, let me answer my own question: Here’s one good(?) reason to use %Return%: Microsoft Word 2011. And it uses CR for line breaks when you copy text from Word. I guess the unexpected should be expected with Word WRT the Clipboard. Also, in Classic Mac OS there were nothing except applications. Besides, 99% of all clipboards copied on the Mac are copied from Applications. No, CR on the clipboard is to be expected. That is perfectly normal for Mac. It seems the UTF8 flavor typically has line feeds, but other text flavors typically have CR, so it will depend which one is used in any given situation. Seems like LF (%LineFeed%) (shouldn’t that be either “Linefeed” or “linefeed”?) is overall a better choice. “line feed” is two words, tokens are Camel Case, and case sensitive, so it is %LineFeed%. @peternlewis, OK, thanks for the info and the lively discussion. Just so I'm clear, and maybe it will help others, here's a summary of my understanding. • Correct use of \R per Peter's post. Submitted for your review, comment, and/or revision. What is put on the Clipboard is dependent on the Application where the copy command is done. Newline character could be either CR or LF, but most likely CR. Again, we need to allow for either (see #1). I thought I had seen cases where it matched CR, but I cannot reproduce that with Keyboard Maestro 8.0.3 (8.0.3) on macOS 10.11.6. When you paste source text to RegEx101.com, it converts all CRs to LFs. I have reported this as a bug to the developer.